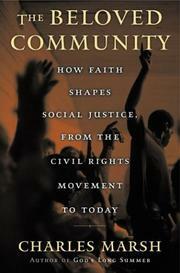 “The revolution begins in the pews.” So opens this closely reasoned study of the faith expressed in good works like the Civil Rights Act and antipoverty movement. At the heart of Marsh’s (Religion/Univ. of Virginia; The Last Days, 2001, etc.) narrative stands Martin Luther King Jr., who, like Jimmy Carter, found inspiration for a socially active Christianity in the writings of Reinhold Niebuhr but became convinced that the Christ of the theologians is an abstraction—and that “abstractions cannot empower acts of compassion and self-sacrifice, or sustain the courage to speak out against the day.” Certain instead that God lives in action, King chose to use faith-based action as an instrument of social change. He inspired many followers but was far from alone, and the great service of Marsh’s book is to introduce readers to inspiring figures they may not have heard of. One is Clarence Leonard Jordan, a former seminarian who founded an agricultural/religious community, Koinonia Farm, that didn’t set out deliberately to work for civil rights but came to be a center for the nascent movement in Georgia in the 1940s as its members created “opportunities for economic development among rural blacks” and “an organic approach to racial healing.” Another is John Perkins, an African-American pastor who came to see racism as an illness and its perpetrators as victims. He remarked that “Racism is satanic, and I knew it would take a supernatural force to defeat it.” Fond of twitting conservatives who profess faith but then flock to the likes of Oliver North, Perkins joins many other progressive Christians in the South who are committed to resisting racism and injustice and to founding that city-on-a-hill vision of “the beloved community,” a body embraced but not contained by any church. Faith is not about reifying the American way of life, Marsh insists, or other forms of delusional self-worship; it is about doing good. Here, he offers examples of spiritual vision at work—and hard work at that.